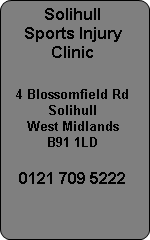 Solihull Sports Injury Clinics in Solihull and Tamworth see many golf related injuries. Often back pain and neck pain from playing golf are the presenting complaint when they arrive at our clinic. Shoulder pain and wrist injuries can result from a poor golf swing or excessive work on the driving range. In severe back pain cases like sciatica, which is a trapped nerve, can cause much discomfort and stop you playing golf. Our sports physiotherapists can help you get back playing in the quickest possible time. We have Osteopaths, Physiotherapists and Acupuncture practitioners available to treat your back injury and back pain. Sports Injury Specialist John Williams treats many golfers with golfing injury problems. Physiotherapist and Osteopath John has worked at The Belfry Hotel treating golfers at the famous golf course which hosted the Ryder Cup. He also treats the golf pro's at many local golf courses which is a result of word of mouth referrals from other golf professionals.